Sydney is having horrible weather since last week. I almost believed that we are still in winter, its cold temperature puts aside my new dresses, makes me wonder whether I will need them at all. Especially this weekend, it’s been raining all days, not sure about you, but I feel pretty depressed and gloomy in days like this. I constantly feel the need of hot tea and cozy couch with a blanket, but I did manage to go to the Pilates class on Sunday morning. So proud of myself! Rather than hot tea and reading a book, what alternative would be perfect for weather like this? Yes, baking! I can’t think of a better way of spending a rainy Sunday afternoon rather than baking. What am I baking then? My breakfast for next couple of days is not ready, what about some banana bread for breakfast? I like banana bread, not when it is too sweet though, all banana bread I get from the coffee shop are overloaded with sugar. Why not try to make some of my own even I haven’t tried to bake bread myself before, but should definitely give it a go, that will make this afternoon worth spending. To make it even more creative I decided to add some fresh blueberries, and to make it healthier, I used buttermilk. The outcome of my first baking loaf experience are surprisingly positive. I really should spend more time on it. Another thing I can tell you for sure after this busy afternoon, is that it is not an easy job to bake and photograph at the same time. I made it still, and I wish you can smell my yummy banana bread with blueberry flavour. Obviously that is not possible, and that’s why I put this recipe here, you can pick another rainy day to try it out yourself. Of course it doesn’t have to be a rainy day! Good luck with baking, don’t forget to share your fruit if you do. Preheat oven to 350 degrees. Coat an 8 1/2 inch x 4 1/2 inch loaf pan with nonstick cooking spray. Whisk flour, baking soda and salt together in a large bowl. Stir in brown sugar. In a medium bowl, combine oil, egg, buttermilk and vanilla extract. Add these ingredients to the dry ingredients. Stir in mashed bananas. Mix fresh blueberry. 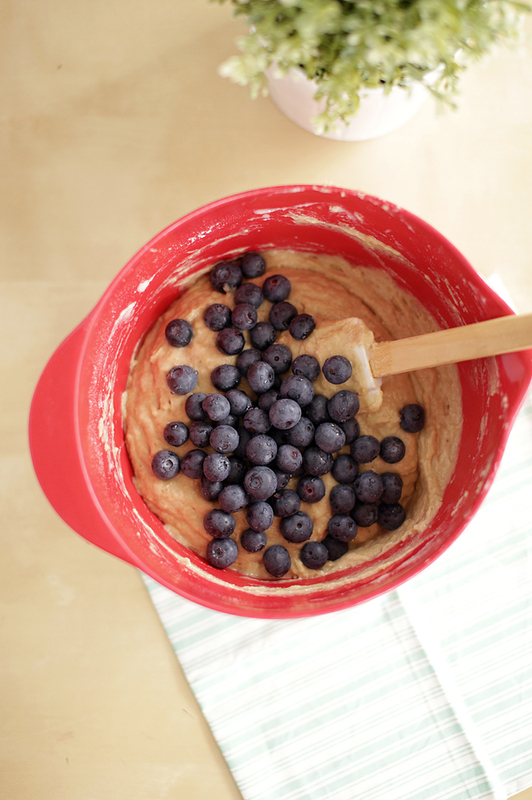 Pour batter into the loaf pan and bake in the oven for 50-60 minutes. Tip for check if the loaf is well cooked, stick a toothpick into the loaf, until it comes out clean.